The Evad3r team has been working diligently for an untethered jailbreak for iOS devices running iOS 6.0 through 6.1. While they’ve had a few exploits in the works, they wanted to wait for Apple to release 6.1 to see if any of them were patched and to also give a longer life jailbreak. 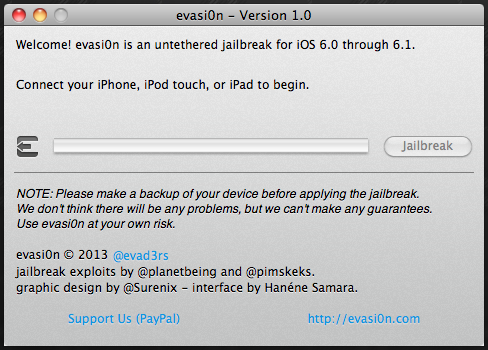 Well today is launch day for the Evasi0n untethered jailbreak tool. Just as you would expect, it is available for Windows, Mac, and Linux and is a simple one click process. Keep in mind that before attempting to jailbreak your iOS device, it is important to backup just in case things go bad.